I've seen this type of manicure spam all over my pinterest, at £30+ a manicure I thought.. no frigging way. DIY. So this is one of my favourites and I just took some crafting gems you can get from any craft store as they're cheaper than beautician gems. They work the same you'll always need a top coat to secure it though. 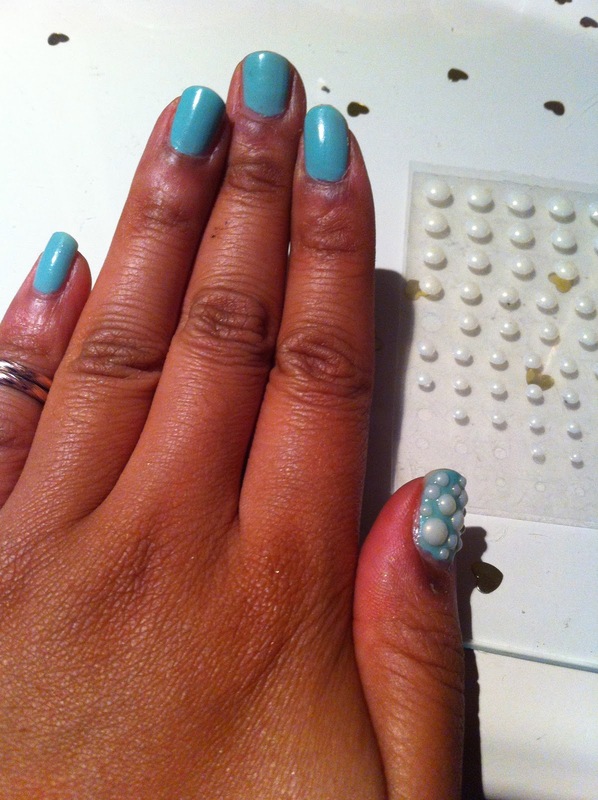 Teamed the pearl bubbles with my Barry M varnish. What do you think? I love it! Can't stop stroking them, its so bobbly and weird. Probably should stop before they fall off... but they're soo soft! Urmm, anyway hope you try it out! Its really simple you just place them randomly or I've seen some following the cuticle or even little cross designs! Cute nails! I bet it feels weird, but it's really cool looking. This color is fabulous!!!! Love the gold detail. GREAT blog.